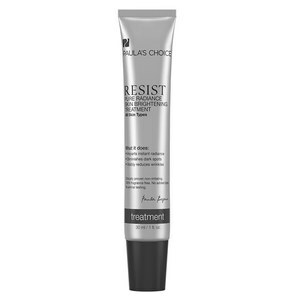 Resist Triple-Action Dark Spot Eraser 7% AHA Lotion is a specialized anti-aging product that works two ways to improve the appearance of skin: 2% Hydroquinone lightens discolorations while 7% Glycolic Acid refines skin texture to promote a radiant complexion. Glycolic Acid not only boosts the efficacy of Hydroquinone, it works to refine skin texture and enhance collagen production so skin looks younger. Apply once or twice daily to cleansed, toned skin. Spread a thin layer over areas where discolorations and breakouts are a concern. During the day, follow with the appropriate Paula's Choice sunscreen (essential to prevent discolorations from recurring). At night, follow with Resist Super Antioxidant Concentrate Serum. Results for discolorations should appear after 8–12 weeks of consistent use. Other Ingredients: Water, Glycolic Acid, Dicaprylyl Maleate, Glyceryl Stearate, Ethoxydiglycol, Cetearyl Alcohol, Butylene Glycol, Glycerin, Lactic Acid, Cyclopentasiloxane, Sodium Hydroxide, Stearic Acid, Isostearic Acid, Magnesium Aluminum Silicate, Cyclohexasiloxane, Rosa Canina (Rose Hips) Fruit Oil, Squalane, Dimethicone, Tocopheryl Acetat, Panthenol, Allantoin, Hydrogenated Lecithin, Bisabolol, Sodium PCA, Kojic Dipalmitate, PEG-100 Stearate, Xanthan Gum, Sodium Bisulfite, Sodium Sulfite, Disodium EDTA, Sorbic Acid, Benzoic Acid, Chlorphenesin, Phenoxyethanol.